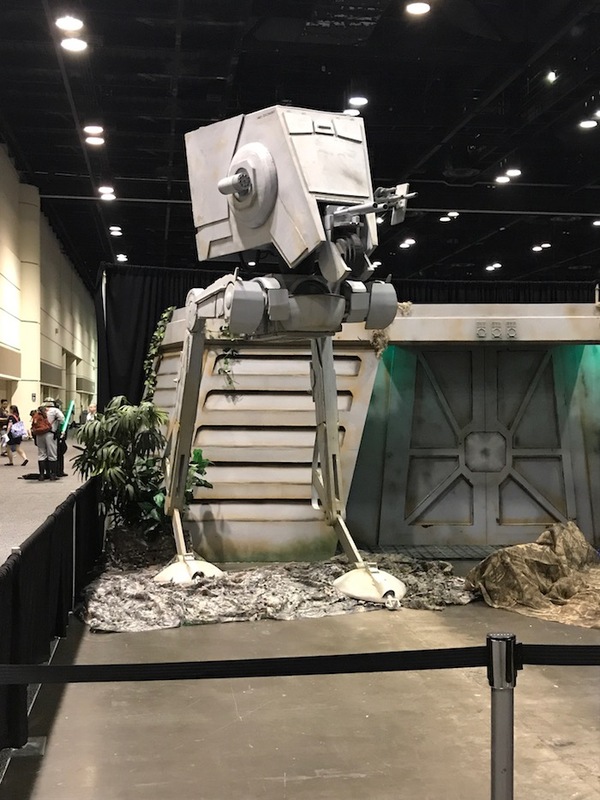 Star Wars Celebration, Lucasfilm’s official fan celebration, was held this year at the Orange County Convention Center in Orlando, Florida from April 12-15. 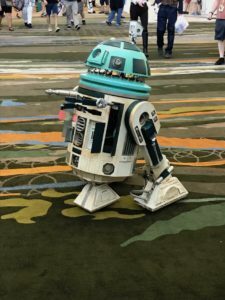 For three days I went to a variety of panels and heard from some amazing people to bring the latest news and happenings from the world of Star Wars. The panels where a major part of the experience and the ones I attended were the 40 years of Star Wars, The Last Jedi panel, Star Wars Rebels Season Four Sneak Peek, a talk by Doug Chiang on the production of Rogue One, Lucasfilm Publishing writers’ roundtable, and a Marvel panel. Along with the panels, which can read in detail on gameindustry.com, I explored the show floor and got to see some amazing cosplay. 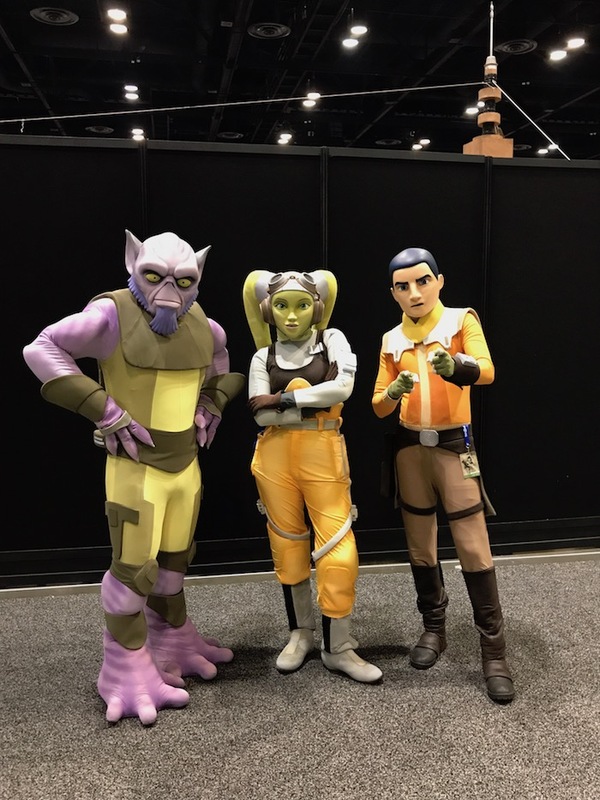 This article will be about the cosplay, extras from Star Wars Rebels panel, and what I saw while roaming around the show floor. 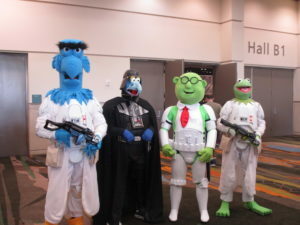 The Imperial Muppets were amazing and funny! 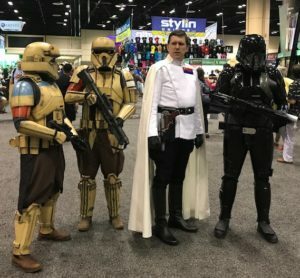 What convention is not complete without cosplay coverage? 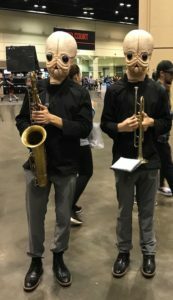 At Star Wars Celebration many people came dressed in their best Star Wars costume. Some of the costumes were unique and comical while others had a lot of thought and work put into them. That is what these events are about, for fans to dress up in their favorite characters and show their love for Star Wars. I even saw people who combined different genres with Star Wars but mainly it was characters that are known from the movies, games, and books, both human and alien. Some of the aliens were fantastic, including two Bith from Figrin D’an and the Modal Nodes band in the Cantina during A New Hope. They even had real instruments to play the iconic song. A group did Imperial Muppets; those guys were hilarious, along with My Little Pony Star Wars, and Batman Trooper and Batgirl Jedi. In the real Star Wars Universe I spotted an Ithorian and his friend a Snivvian. A large Ewok, Twi’lek Jedi and Sith, and a fabulous Wookiee were among some of the alien species cosplayers. I also came across a very comical Darth Maul and wampa. The Old Republic was representing with Darth Revan, Dark Jedi, Mandalorians, and Darth Nihilus. There were quite a few Imperials on the show floor, but there were also rebels and Republic characters. I got some shots of the characters from Star Wars Rebels but also clone troopers and Ahsoka. Captain Rex was there and I got a great shot of X-Wing pilots next to a car transformed into an X-Wing. The show had scenery backdrops and movie logos that made for some good cosplay photos. Let’s talk about the Imperials. 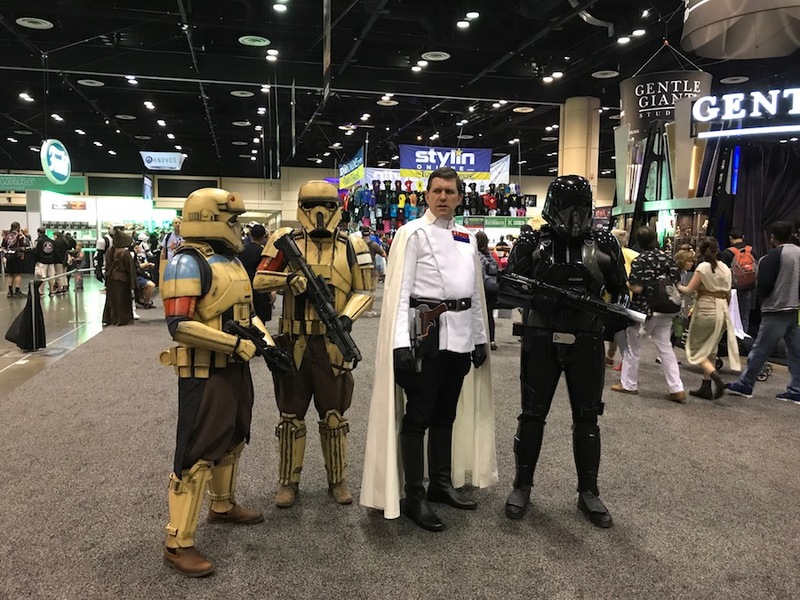 The darkside was strong at this convention and it showed. Everywhere I walked I saw an Imperial officer, trooper, or TIE-pilot. There were also plenty of stormtroopers around. One big reason was the presence of the 501st and Mandalorian Mercs. Other than the Imperials from Rogue One I saw a few Jyn Ersos, and one Bodhi, plus some Chirrut Îmwe cosplayers. However, The Force Awakens was well represented with Rey, Kylo Ren, Finn, and Poe Dameron. Both the prequels and original trilogy had many cosplayers . From Anakin, Jedi, Qui-Gon Jinn, Darth Maul to the Rebels, Imperials, Luke, Han, Obi-Wan, and Leia. The show was complete as Darth Vader and Boba Fett walked the floor. Not surprising there were many different Leia cosplayers from Princess Leia, General Leia, to slave Leia. 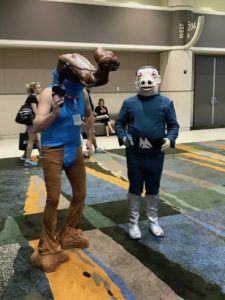 Continuing on my journey around the convention center I came across a duo as the male Aqualish Ponda Baba and the disfigured human Cornelius Evazan. Admiral Ackbar showed up along with a sandperson and someone dressed as an incredible C3-PO. He was posing with an R2-D2 and looked like he stepped off of a movie set. Another unique costume was the lightsaber. 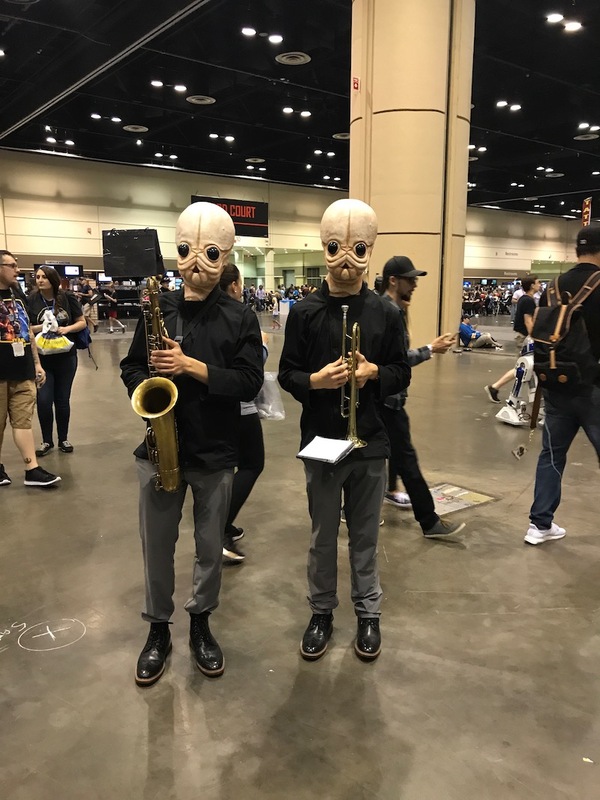 The cosplays at Celebration were amazing from the more professional ones to the first timers. Everyone was having fun and enjoyed posing for photos. However, two characters stood out, besides Leia, at the convention, Ahsoka and Rey. The force is strong with the female heroes of Star Wars. During Celebration I noticed that Rey and Ahsoka were popular characters. 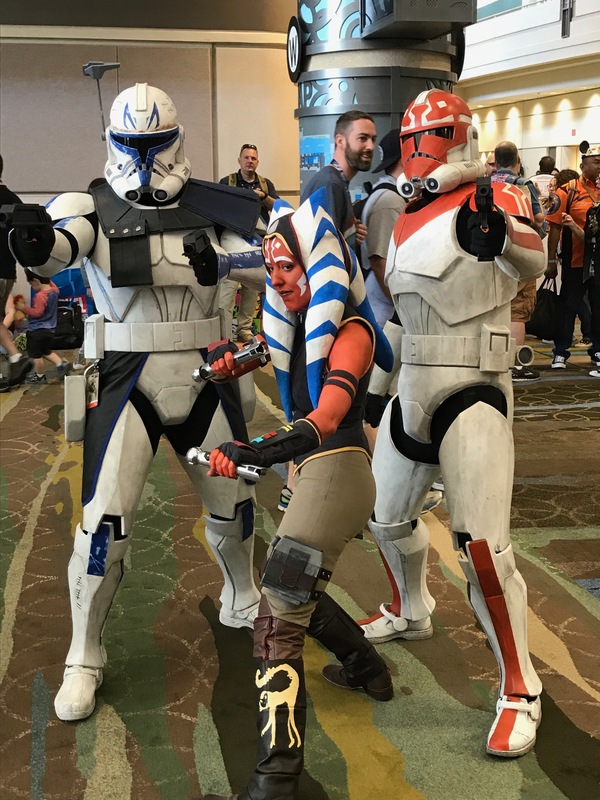 Ahsoka is probably one of the most popular, not just cosplay but as a Star Wars Character. It was in the Rebels panel and then the Marvel panel on Saturday that I truly realized how important Ahsoka is to fans. At the end of the Marvel panel we were asked which character we wanted to see in a future Marvel Star Wars. People shouted out Ahsoka and the “scientific” poll taken reached the same conclusion, fans want Ahsoka. Hopefully we get an Ahsoka comic. The Rebels coverage was a highlight of the show, as a fan of the series but also what it meant to the larger audience and the growth of the stories and characters. These shows plus the books and comics bring more to the audience than just the movies. 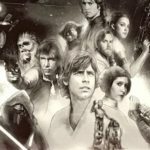 They are not only the backstories and bringing small characters to life but they inspire and take us on an incredible journey to a galaxy, far, far, away. 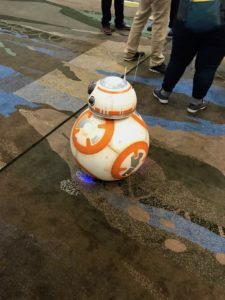 Going to this convention was a chance to learn more about the movies, books and comics, and the animated series Star Wars Rebels. Keeping on with the show, I had the opportunity to sit in on the press conference following the screening of the trailer to learn more about the characters and show. Going back to fans loving Ahsoka, we last saw her walking from Darth Vader and their fight at the Malachor Sith temple. What we don’t know is if it meant she was alive. Is Ahsoka alive? Dave Filoni isn’t talking though he teased us with his shirt during the Rebels Season Four sneak peek. He came on stage with a shirt that said “Ahsoka Lives?” then after the trailer he had a shirt that said “Ahsoka Lives!” At the press conference afterward it was back to the original and he joked that we didn’t see anything. Her fate is still a mystery but that doesn’t mean she might appear again in some form or in other media, like the comics. Rebels press conference. 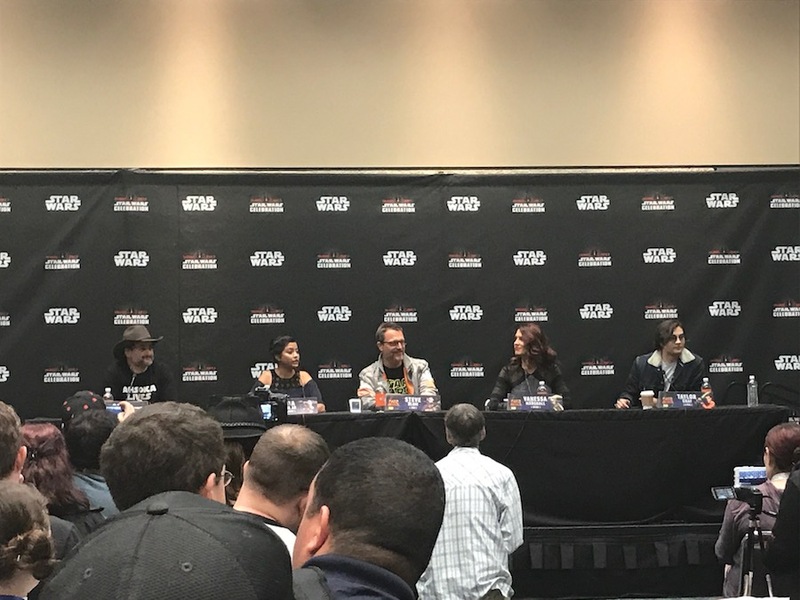 Left to Right: Dave Filoni, Tiya Sircar, Steve Blum, Vanessa Marshall, Taylor Gray. Moving on from Ahsoka, we learned that the show is ending after Season Four but in a way that is meaningful to the audience and the characters. 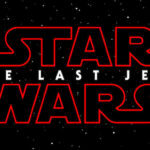 During the same press conference Dave Filoni said it best, when discussing the ending of the show, that Star Wars inspires and gives hope to everyone especially kids. Even though the show is ending we saw along the way tragedy and hope and in the end Rebels was “the journey of the hero and the journey of us all”. 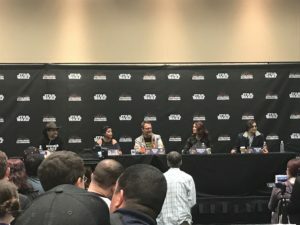 In Season Four we most likely aren’t going to see the return of Vader but Dave Filoni says that we will be getting more Thrawn. During the press conference, the voice actors gave some of their impressions on the characters from where we last saw them in Season Three to Four. Vanessa Marshall, voice of Hera, says that Hera always has hope. We have heard her iterate that in the series but the actor feels this is true to the character. It is what keeps Hera continuing with her mission and keeping her Ghost family together. There is loss in the series and at times the characters struggle but through Hera they find a way to continue on and this also wrings true for Kanan who needs her as much as she needs him. With the incredible story arc of Sabine Wren Tiya Sircar, the voice of Sabine, spoke more to us about her character’s development in Season Three. Her turning point was during the Trials of the Darksaber when almost giving up hope; she turns and continues her training fight with Ezra. Tiya said how the Ezra moment was when she grows up as her biggest fears are finally released. During the same episode Kanan also almost gave up on Sabine until Hera has him give her another chance and to trust Sabine. Vanessa Marshall gave us more insight into this dynamic when she said that Hera is very close to Kanan and that he just needed someone to show him the way. Going back to the beginning of the season Kanan also needed the help from the Bendu to continue training Ezra. Steve Blum, Zeb, told us that his time with Kallus was a profound experience and Zeb saw himself in Kallus and the actor during that moment on the ice moon reacted personally to it. Season Three saw Kallus also have a change during that experience. For Ezra, Taylor Gray said that he had a hand full of defining moments. One of those was when he saw how Sabine dealt with her family when he realized a new calling. As Sabine went back to help her family and Clan, he was inspired to go back to help his people on Lothal. This will define his character coming into Season Four. We can’t end any talk about Rebels without saying something about Thrawn. In Season Four we go in with Thrawn having left the rebels scattered and defeated from the encounter at Atollon. Now Thrawn has the high ground as the rebels amass a new fleet of fighters, but can they fight him and his tactical genius. Thrawn may have come off the battle with a victory over the rebels but he faced the Bendu. Dave Filoni was telling us that the Bendu was an enigma to Thrawn but this drives his study of art to try and understand this greater being. These uncertainties are a weakness to Thrawn’s technique as he can’t anticipate and prepare for them. However, as we have seen in Season Three he is a difficult villain to beat. What is in store for our rebels? We do know that Hera and Chopper are in Rogue One. In the movie Hera is a general, though we might not see her promotion in the upcoming Season. Hera is not the type for fanfare but more the get into the action type of character who leads the charge into battle and the fight for the Rebellion. Throughout the series she has been the matriarch and the rebels are her people so its fitting she gets that promotion and continues on. However, the fate of the other characters will have to wait for the premiere of Star Wars Rebels Season Four in September. Until then you can read my recap of the panel and trailer here. 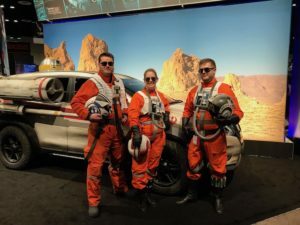 Back on the show floor and stepping away from the panels, we saw many different props and everyday vehicles customized with Star Wars details. There was also a 501st experience with many more props including a Tatooine recreation with Jawas and a sandtrooper on a Dewback. Also in the 501st experience were helmets and costumes including troopers, Darth Vader, and Boba Fett. On the show floor there were also costumes of movie characters. 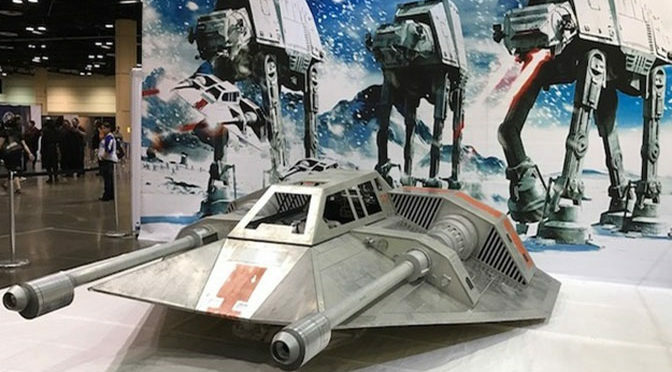 Another highlight of the show were the Star Wars vehicles including a reconstruction of an AT-AT, AT-ST, snowspeeder, and the amazing TIE-fighter at the Starwars.com Live stage. The TIE-fighter was where a lot of the action was happening because of the stage, which also included a recreation of Jabba’s palace. Throughout Celebration celebrities and guests would come to the stage to talk to Starwars.com hosts but also cosplayers were invited to the Jabba’s palace to take part in the show. While spending time at the TIE I got to see on stage Sam Witwer (Starkiller Force Unleashed games, Darth Maul The Clone Wars and Rebels), Anthony Daniels (C3-P0), and John Boyega (Finn The Force Awakens). John Boyega just showed up unannounced with a Tee-shirt canon. It was an awesome moment but also one that showed how much these actors love their fans and being at the event. Then was back to the main floor to see the incredible work that went into turning average cars and trucks into Star Wars cars and trucks. There was also a working motorcycle that had the body of an speeder bike. 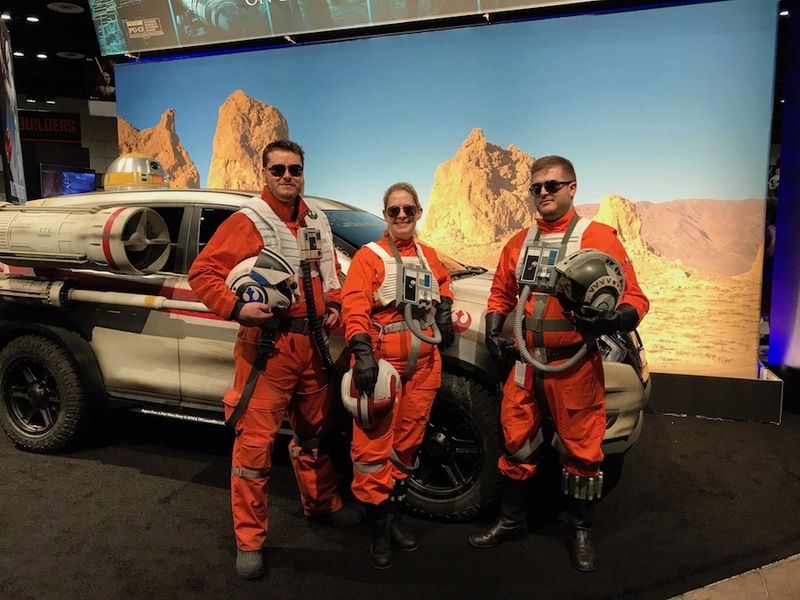 Guests also could see a BB-8 Volkswagen Beetle, Boba Fett Hyundai, and a Darth Vader car. They also made excellent backdrops for cosplayers. Recreation of General Hux speech at Starkiller base. Props were not the only things on the show floor, there were many exhibitors and artists for Celebration goers to buy merchandise from and meet their favorite artists. From Hasbro, Del Rey, many Collectible vendors, to Lego and beyond there were enough to satisfy every guest. They also had tattoo artists on hand to give the most die-hard fans a permanent piece of Star Wars. Some of these vendors also had set up their own recreations. The Kotobukiya booth had a recreation of the General Hux speech on Starkiller base and Lego had created Rogue One and The Force Awakens characters out of Legos. These Lego creations were amazing, not only the detail but also the amount of bricks and time that went into making them. The Death Trooper alone was made with 27,202 bricks and took 349 hours to create. Other characters included Finn, Poe Dameron, and Kylo Ren. 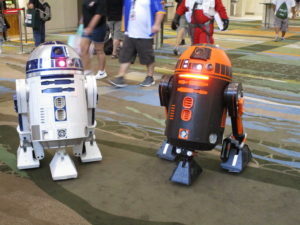 If there was one thing I had to pick as my favorite part of Star Wars Celebration it has to be the droids. 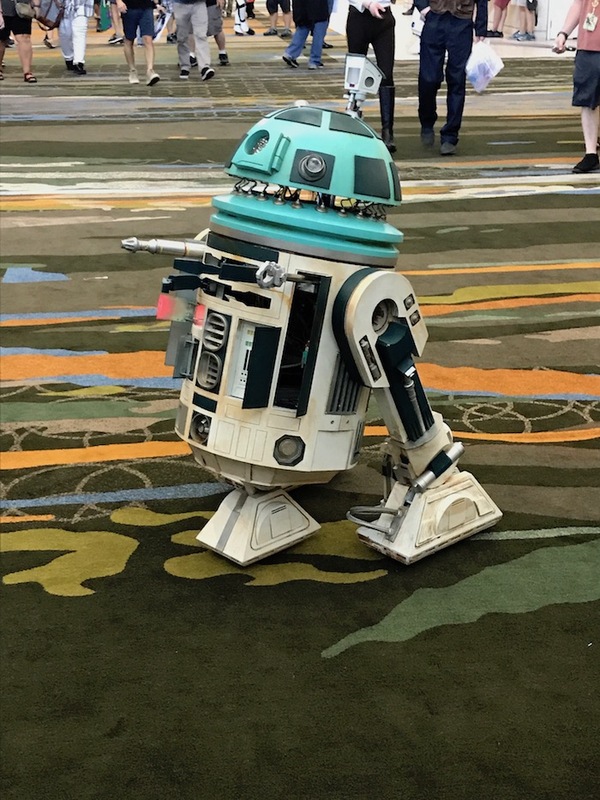 I knew droids would be there and first saw my first R2-D2 on Wednesday but it was actually meeting them and seeing them moving around the convention center that made them the best thing. Who doesn’t like astromechs? Star Wars would not be Star Wars without the droids; they are a very important part of the experience. From R2-D2 to BB-8 they are special with their own personalities and feel more real then just circuitry and programming. Dave Filoni called chopper a person, because that’s how they are looked at and treated in the movies and comics. 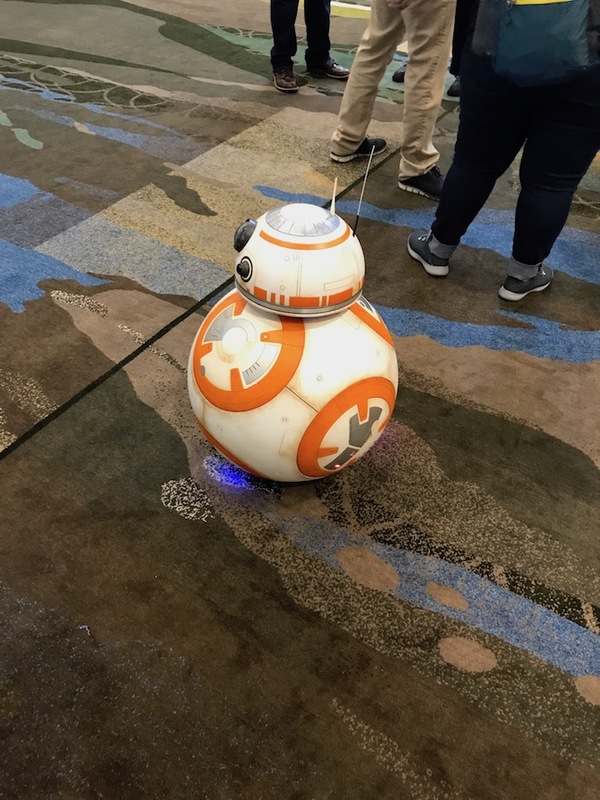 BB-8 is not only Poe’s astromech for his X-Wing but also his companion and buddy. 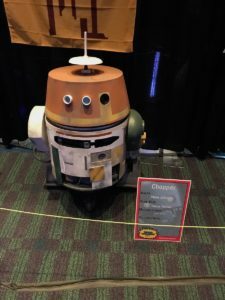 Even these fan creations where made to have their own little personalities and droid language. Spending sometime with the droids and builders I learned a little about what goes into them. For instance the BB-8 uses magnets to move the head separate from the body but will require a gyro to make it more stable. The creator also had to create an internal skeleton to hold the circuitry. There is a lot of engineering, electronics, and motors for the droids to move and function plus make sounds. It also takes an incredible amount of man hours to build and one droid builder told me it took two years to complete his astromech because of the extra gadgets and details. To get started you have to have a love for Star Wars and a passion to build a droid. There are also different builders clubs with information for first time builders and are free to join. From going around the Droid Builders exhibit there was a variety of droids from Republic to Imperial to individual creations including BAT2-D2, and a steampunk looking droid. With each droid was a card that gave some additional information including materials. Some of the materials used were aluminum, plastic, wood, fiberglass, and one droid had 3D printed materials. In one particular case I saw a droid with different arms and attachments that were hidden, similar to R2-D2’s gadgets, including a periscope. 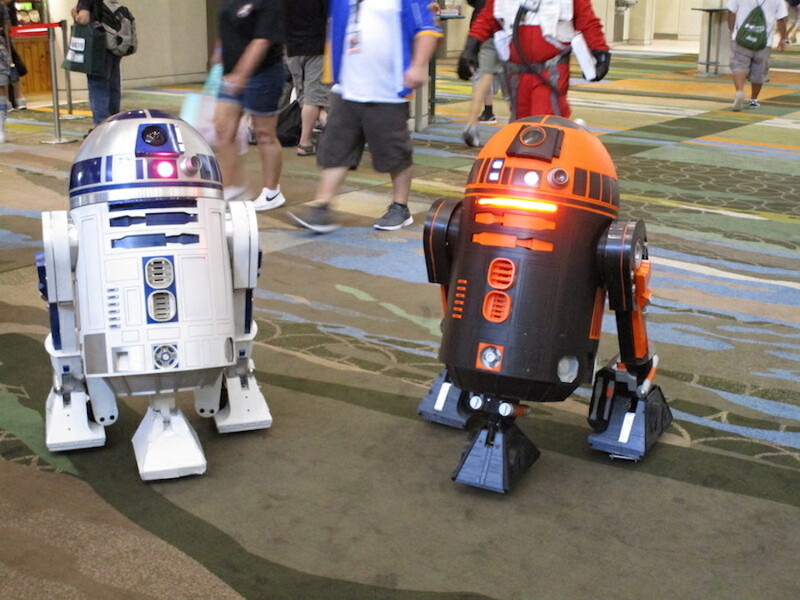 These Droids were not just meeting guests they also participated in droid racing. The race I caught matched a Republic astromech against an Imperial astromech. The republic droid won while the Imperial droid became stuck at an obstacle in one of the lanes. If only droid racing would become a real sport. 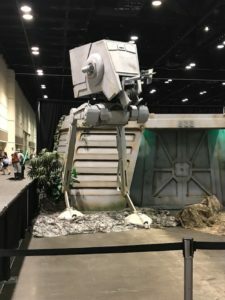 Leaving behind the droids I concluded my time at Star Wars Celebration. What was written in this feature was only a portion of what happened at Celebration, some of the things I didn’t attend were the different classes held at the Star Wars University, collector’s panels, and other events going on at the fan stage. However, what I did see left a lasting impression and many memorable moments that I am now sharing with you the readers. 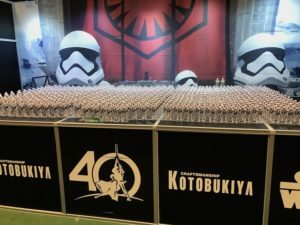 It was even more memorable being the 40th Anniversary of Star Wars and so many special guests came out to celebrate a franchise that has spanned generations. From the oldest fans to the youngest and every one in between they came out to celebrate their love for Star Wars. With a new movie and incredible trailer this was a Celebration to remember, until 2019 and a to be determined location.